8th of March is the International Woman’s day as well as the equivalence of Festa della Donna in Italy. Its been said to be conceived from an event in New York, when women garment workers held a strike over working conditions. In all honesty, I haven’t been all that aware of women’s day since it wasn’t given such a big emphasis when I was in Singapore. But here in Italy, there is a culture here where men are supposed to give women – wives, girlfriends, daughters, female friends a yellow mimosa. Unlike the pink mimosa flowers, with the shy leaves that I was accustomed to, the mimosa here is yellow and they grow in trees. It grows quite abundantly here even – thus I was quite surprised to see florists and street vendors selling them. And when I retold this to Cartcart, he asked me if I was hinting to him to buy some mimosa 😛 But to buy it makes the entire intent seem a little commercialised, so I said no. It was when Cart tells me that sometimes even women give mimosas to other women. And that made me quite excited to experience female camaraderie. Finally a chance to bond across diversities! I dressed up prettily and together we drove off to Gianicolo. It was then when I noticed the spectacular sunset. 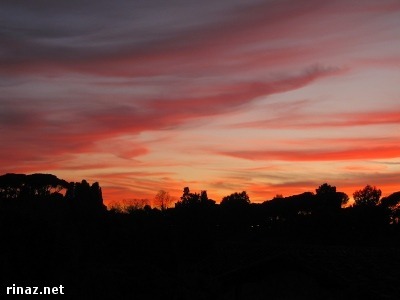 Roman skies are really pretty, to the point of being unreal – like paintings. When we reached Gianicolo, this was what greeted us. Unfortunately for me, there was no women around distributing mimosas and messages of strength and unity. In fact, I didn’t even see any women carrying mimosas! Sidenote : I started jogging again. But the first time I did that, so much cold air went into my lungs and my throat felt extremely dry and painful. At the end, I felt like I was breathing through a straw. It was horrible. Now I make sure I jog with a woolly scarf on. OH wow Marina your skin’s really cleared up! Hey you will get used to jogging in a colder and drier climate. I LOVE running and here in Melbourne, its like perfect running weather (plus the gorgeous parks) everyday. I could just go on forever…. Plus, its good for your figure after all that pasta, mozarella and rich Italian food! Mama mia! Previous PostPrevious Rinaz can cook!